*This is a collaborative post, please see my disclosure policy for details. This summer, we had the opportunity to experience all that the SeaWorld Parks (SeaWorld, Discovery Cove, Aquatica and Busch Gardens) have to offer and I was surprised at just how many thrilling rides we were able to enjoy. The very first ride we experienced in Orlando was Kraken Unleashed - a Virtual Reality rollercoaster that involves riders wearing a VR headset before being taken on a thrilling underwater journey. Experiencing a VR rollercoaster was a first for us and it was like no ride we’ve ever tried before - definitely a feast for the senses! Another exciting ride is Mako, in fact Mako was my favourite ride from the entire week. This hypercoaster gives you a feeling of weightlessness and it’s actually the longest, tallest and fastest rollercoaster in the whole of Orlando. We loved the views across the park from the top of this ride and if you manage to ride in the front row, it’s a ride where you really feel the wind in your face as you speed along the track. A thrilling ride that we all enjoyed together as a family was Journey to Atlantis - this water based rollercoaster was so much fun as we ventured through dark passageways as the ride builds up to an exciting final plunge. Prepare to get soaked! 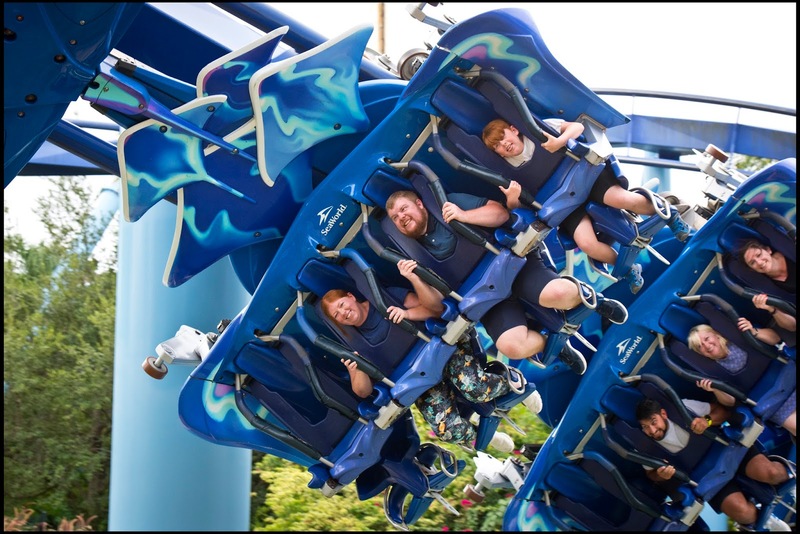 A final ride not to be missed at SeaWorld is Manta - a rollercoaster with lots of twists and turns that allows riders to experience what it’s really like to be a ray. You fly through the air face down and don’t know when the next twist and turn will happen which really adds to the enjoyment. Our first rollercoaster experience in Busch Gardens was Cobra’s Curse - this is a family ride that’s lots of fun. You twist and turn around the track and no two rides are ever the same - you even end up going backwards at one point. Harry and Heidi enjoyed this ride so much that we went on three times in a row. Then there’s Cheetah Hunt which was a real family highlight from our trip to Busch Gardens. Cheetah Hunt is another rollercoaster we wanted to ride multiple times. This ride is super fast and speeds both up and down inclines, it really allows you to experience what it’s like to travel like a Cheetah. If you love rollercoasters, SheiKra at Busch Gardens is not to be missed - this was one of my favourites and is a rollercoaster that really builds the tension as you wait for the big drop. Steve and I built up the courage to try Falcon’s Fury - your seat climbs the tower before tilting forward and holding you in position before plunging to the ground. This ride is super high and I think it’s fair to say it’s the ride Steve was most nervous about - we absolutely loved it though and if you want to challenge yourself, it’s one not to miss. As a family, we really enjoyed Congo River Rapids. It’s a ride we were all able to ride together and the screams were real as we headed towards fast moving rapids and underneath waterfalls. We all ended up absolutely soaked through so I’d advise wearing a water poncho if you can (or making use of the family dryers afterwards). This ride was Jack’s favourite ride from the whole trip and he spent the whole time laughing hysterically. Aquatica is a water park that’s home to lots of thrilling rides and experiences. The most thrilling has to be Ihu’s Breakaway Falls - riders stand on a platform and wait for it to breakaway beneath them. I am so pleased I tried this slide and as soon as it was over I was straight back up there to try it again - it really is a slide where your heart skips a beat as you’re waiting for the big fall. Check out Steve's reverse point of view from this slide below. Turn the volume up so you can hear his screams! Taumata Racer is a slide for the whole family - up to 8 riders can grab a mat and race down the slides together or try to beat their own time. This allowed our competitive streak to come out and I can’t believe the boys beat the girls! Then there’s Dolphin Plunge, a fun ride that travels through a Commerson’s dolphins habitat at high speed. We really enjoyed the variety of tube rides at Aquatica too - Omaka Rocka speeds down massive funnels and really catches your breath and Whanau Way allows you to ride in twos so you can experience the fun with your children which was extra special. The rides at the SeaWorld Parks are unlike anything we’ve ever experienced before. We’ve never had the opportunity to see animals like cheetahs, sharks and rays before, let alone experience what it’s like to become that animal. Oh my gosh, it looks like you had an absolutely amazing time! I didn't even know that the SeaWorld parks were that big, let alone that they had rides. I'm not a massive fan of rollercoasters, but I actually got goosebumps a little bit while watching you whizz around in the videos. Great post, Sam! I had NO idea they had all of these rides! You learn a new thing every day! I love the sound of the VR one, great idea. I just love how adventurous you are and your smiley face in your photos! You are very brave! I'm a complete wuss and always end up standing at the bottom of the ride holding everyones bags! The SeaWorld rides look incredible, I had no idea they had all those rides! Simon would love them!